Hot on the heels of our first room to be finished in our renovation project (as written about in our blog: Fabulous Fifi) we have this week completed our second room! 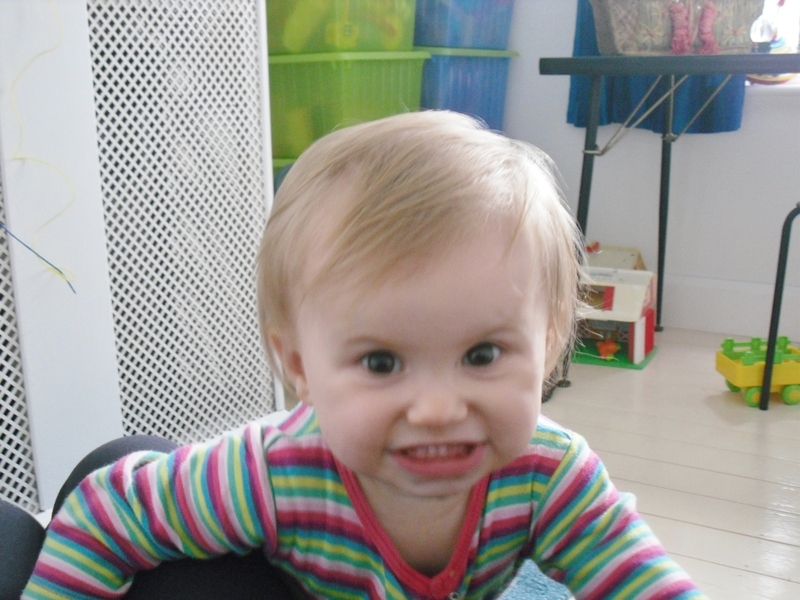 Our first result was calm and relaxing and…ours! The second is the playroom. We decided some time ago to give up the stand alone dining room….handing it over to our two small children, Herbie (3) and Kitty (1). With the thought of no kids TV in our lounge and no toys underfoot, we have been spurred on to get them to play away in their own little lounge. 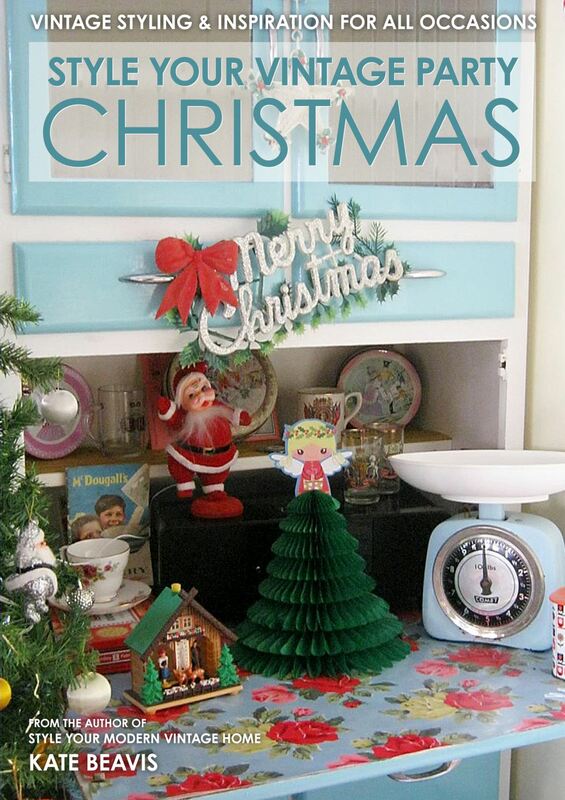 So…..we filled it with my turquoise Formica topped 1950s furniture. 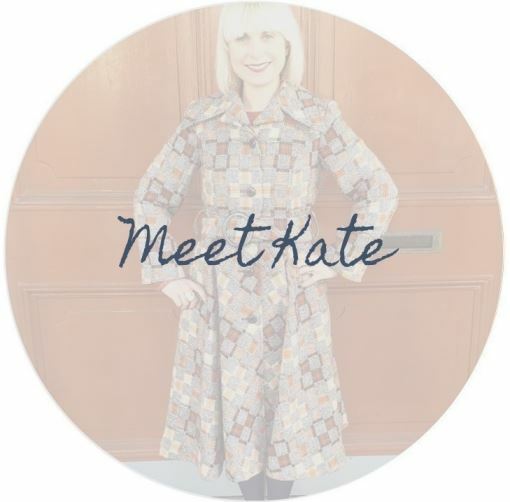 It is lovely with black and gold swirls all over it…and more importantly it is wipeable! The table has screw on black splayed legs and is now their art table. 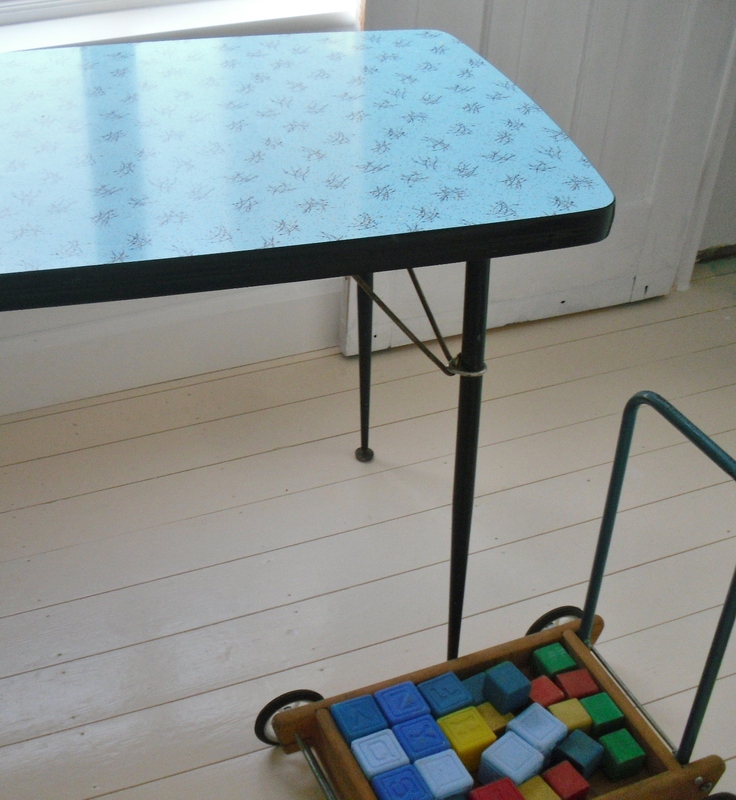 Yes, the paint is now banned from my Ercol elm dining table and I am now a lot calmer! 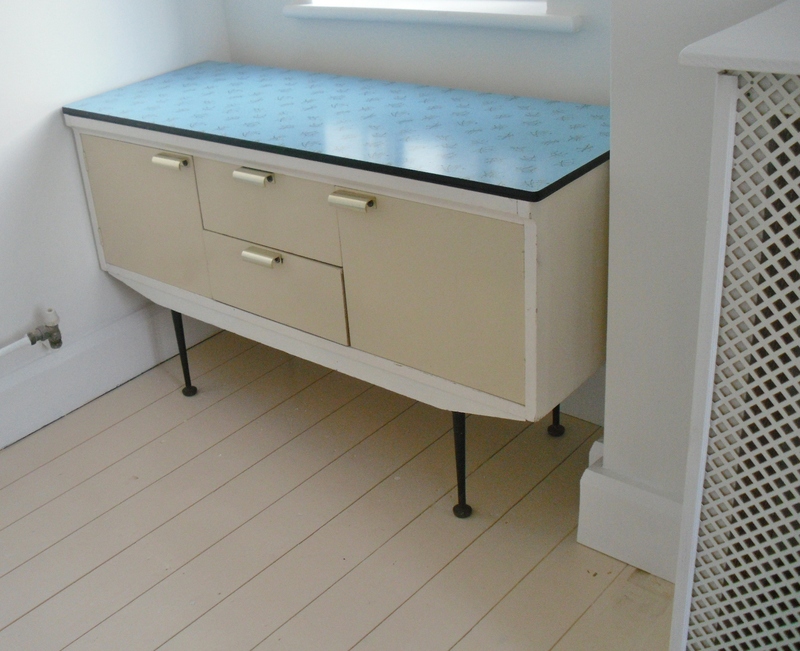 The sideboard is so cute with its cream and white paintwork and blue top. 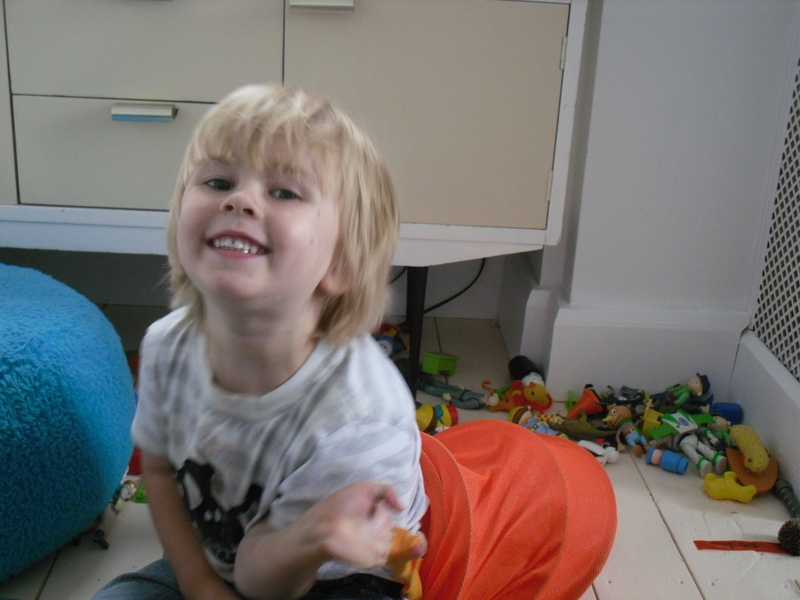 Again perfect for little ones….any marks can be simply re-touched with a bit of paint. 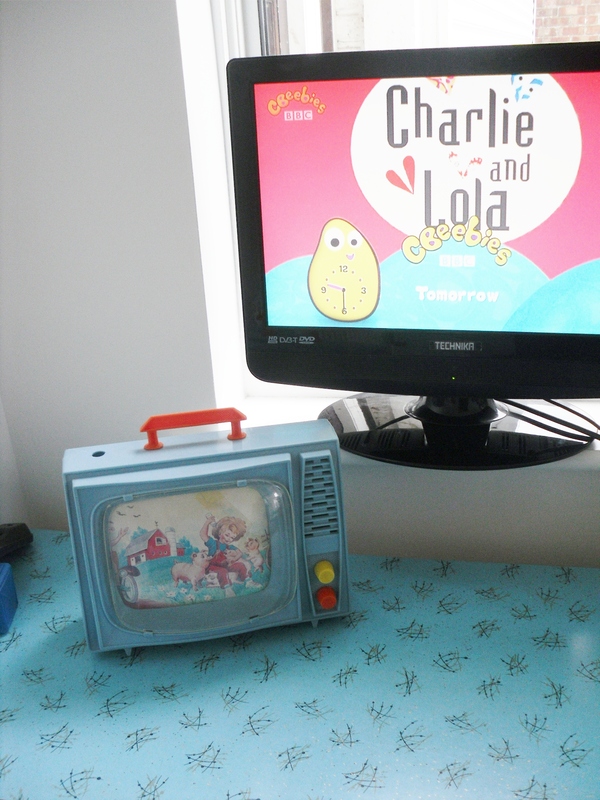 The modern TV stands on this..alongside the vintage toy version. The old room had an unsightly 70s fireplace in front of the back boiler. We found out it cannot be replaced without changing the boiler…so we built a cover. You now can’t imaging its hiding such a monster…and has now doubled up as a mantlepiece with some of the favourite toys on. 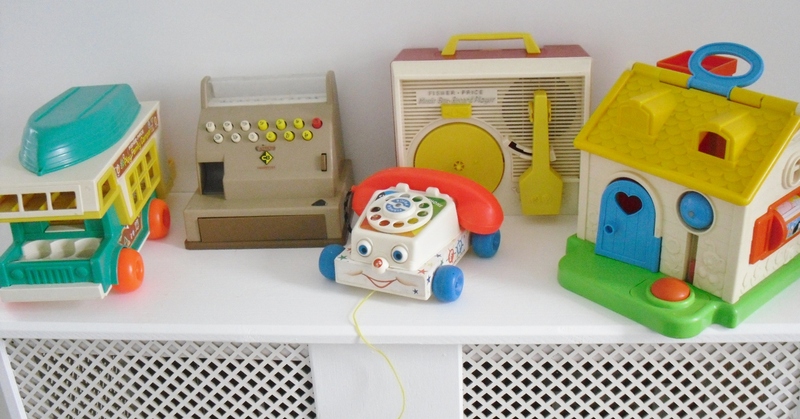 Now this house LOVES vintage Fisher Price..and here is just some of it. 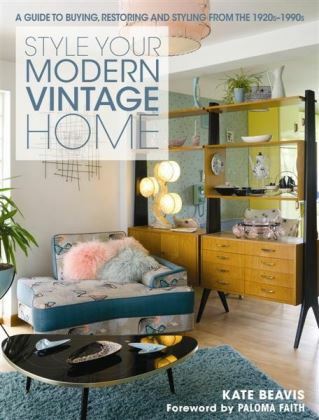 The camper van is a firm favourite especially as we have a 1967 VW split screen. The top comes off and forms a boat. Then there’s the record player. I actually played with this when I was younger and is still going strong. 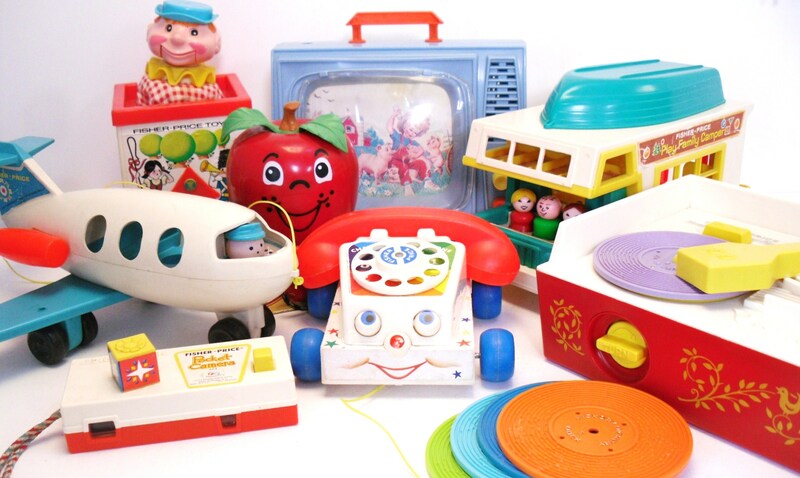 As mentioned in our magazine article “Play the Vintage Way” for Vintage Life magazine we think they are fantastic toys especially as they don’t need batteries. Gosh then there’s the cash register..again my favourite toy when I was younger (maybe a clue that i would spend 20 years in retail)…I used to charge my family to buy tinned food that of course was theres. I would then keep the money! Herbie seems to be repeating history. The chatter phone and the cottage join them. We also have…are you ready: the farm, the zoo, the school, the Happy Apple, the Jack in the box, the radio, the activity centre, 2 chime balls..the list goes on! They have shelves in the alcove for all their stacking boxes of yet more toys. 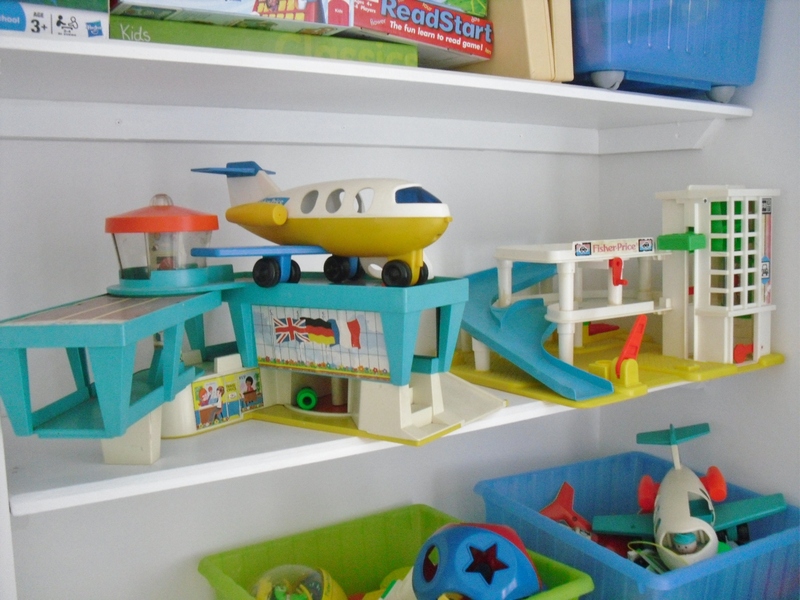 The Fisher Price airport and garage stand proud on the first shelf. 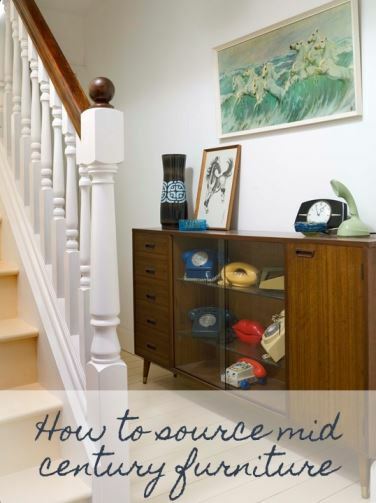 You can just see their 1970s Tupperware shape sorter in the picture! 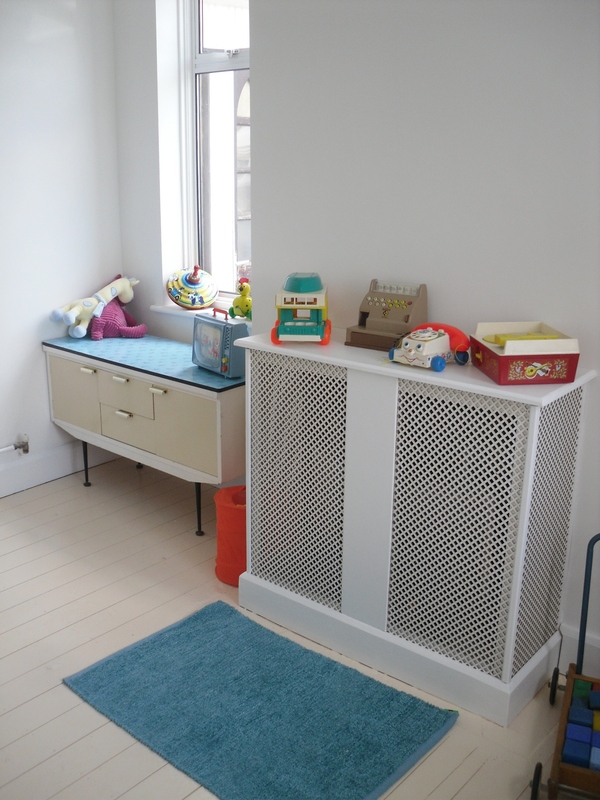 We have chosen joint toys for this room..Kitty’s collection of dolls with their rocking crib, high chair and pram all dating from the 1950s will be in her room. Herbie’s ridiculous collection of Tonka trucks will be in his room. 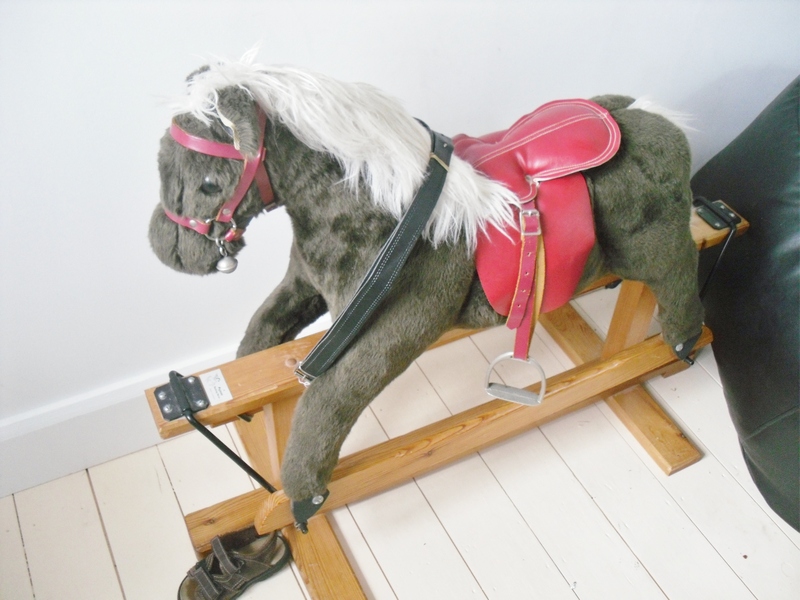 So we have Pegasus, the 1970s rocking horse left for them to share, along side wooden bricks and the metal toys. These were very popular in the 1950s.. factories were given up for war manufacturing during the 40s which resulted in a huge boom in the 50s with metal becoming available again. 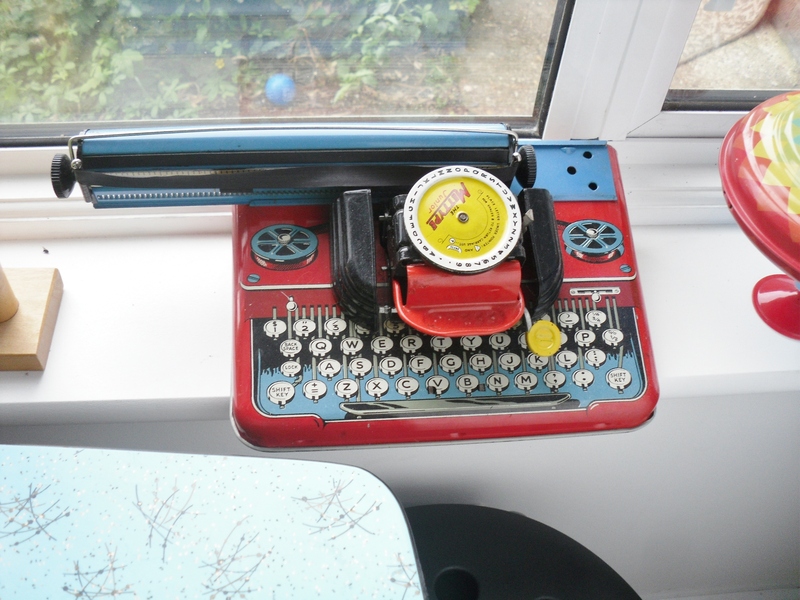 Often toys replicated the toys of the parents…such as this Mettype typewriter. We have a great Chad Valley spinning top and kaleidoscope too! 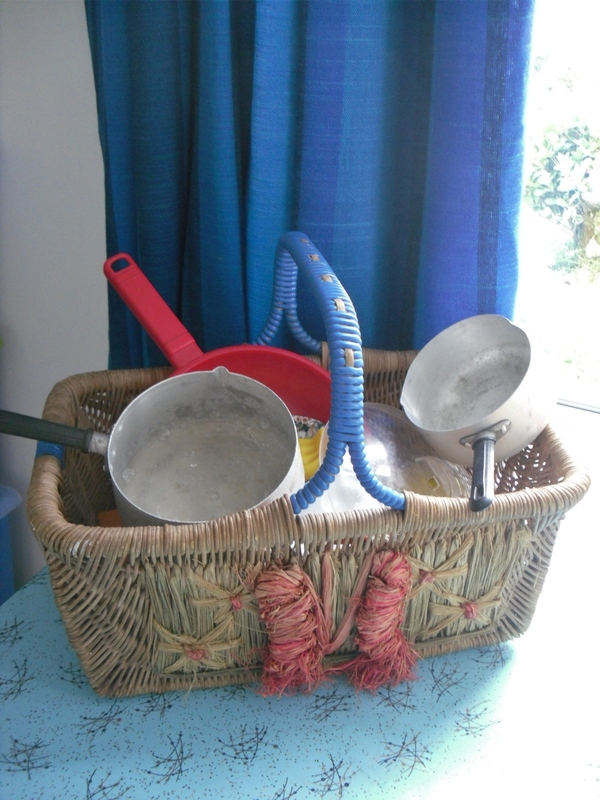 All their cafe/cooking toys (modern) are kept in my 1950s basket….I seem to have lost that one! 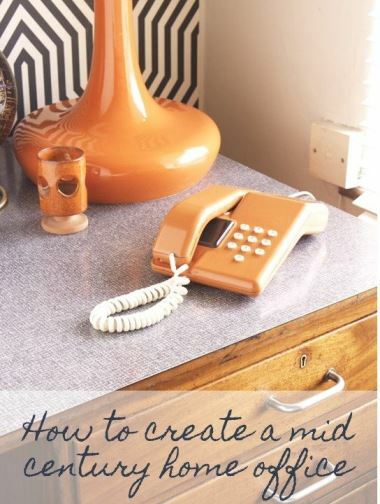 So, back to the interior design…those lucky 2 have a great pair of 60s stripe curtains and one of the best lights in the house! 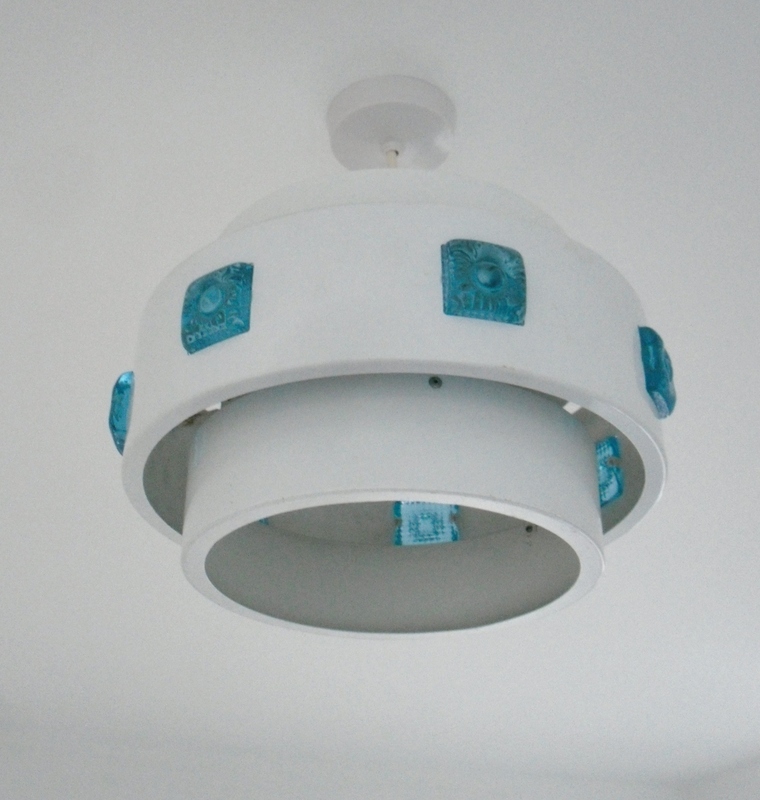 It has squares of bright blue glass all around, giving off a lovely glow when switched on. It was a real bargain too…it was free! Adam found it at a house restoration he was working on..it was in the garage about to be skipped. All the builders on site laughed at his glee…..! 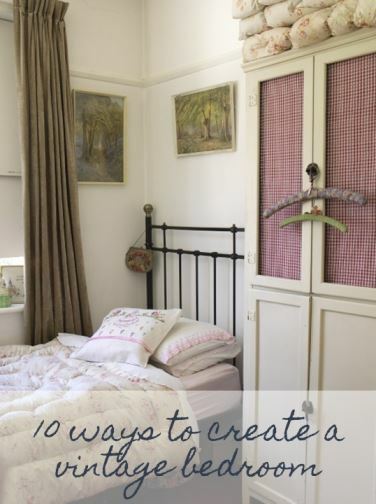 We just need things for the wall…a clock, bookcase and pin board for all their drawings. So children…do you like it? I guess that’s a yes then! 2 Comments on Play Away! 1Pingbacks & Trackbacks on Play Away!